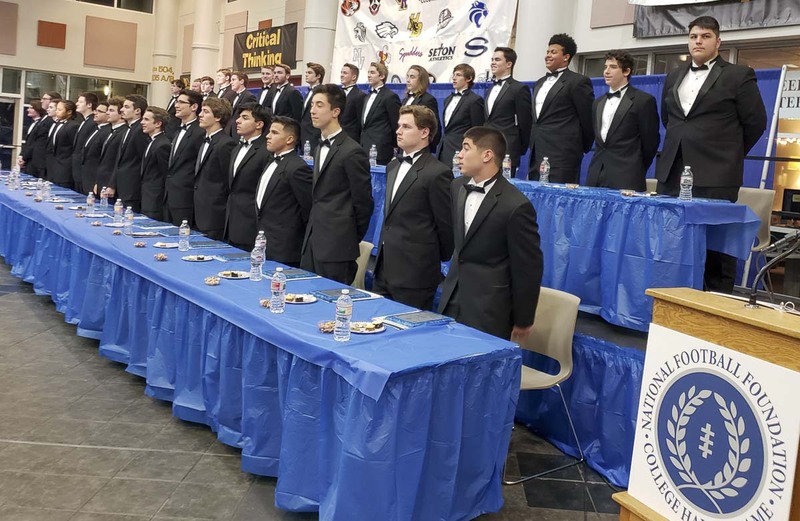 VANCOUVER — Brock Harrison was sitting among all the other nominees, listening to the names of the football players who had earned scholarships. Then he received quite a surprise. He never expected to win. So, too, did Isaac Hoidal of Stevenson. 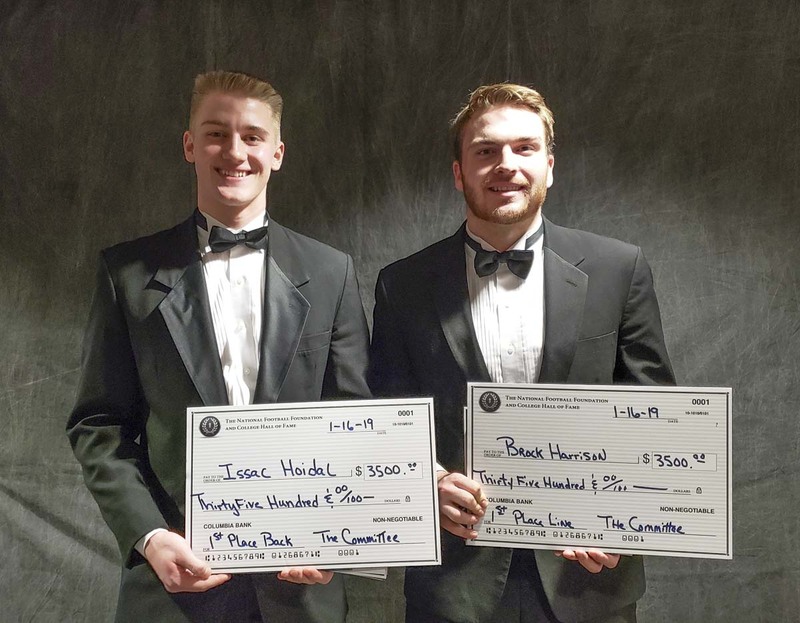 Harrison and Hoidal were named the first-place scholarship winners Wednesday night at the 27th annual Scholar-Athlete Awards Banquet presented by the Clark County chapter of the National Football Foundation and College Hall of Fame. Five other nominees also earned money for college. In all, 33 were nominated from high school football programs throughout Southwest Washington. They were dressed in tuxedos in front of family and friends at the ceremony at Hudson’s Bay High School. Hoidal was awarded a $3,500 scholarship for first place among the nominated backs. Harrison earned the top prize for linemen. Lincoln Victor of Union, who was not present because he is preparing to play in the Polynesian Bowl in Hawaii this week, earned $2,500 for second place among the backs. Tyler Flanagan of Woodland and Andrew Boyle of Camas tied for third. Camas had two recipients. Shane Jamison took second place among the linemen. Oscar Kirkwood of Columbia-White Salmon earned third-place money, $1,500. Fort Vancouver senior Myron Lawrence and his Trapper teammates were honored by the Evergreen Football Officials Association for the sportsmanship they displayed in the 2018 season. Neil Lomax, the former Portland State and NFL quarterback and current Fort Vancouver head coach, was the guest speaker. He said that while he is known for his feats in college and professional football, his mission now is to be known as a coach who guides young players into becoming better people. The Gary Boggs Award for Head Coach of the Year went to Rory Rosenbach of Union. The Titans won the Class 4A state championship. The John Hadley Award for top assistant coach went to Bronson Castellano of Hudson’s Bay. Denny Huston was given the Distringued American Award. In a special moment, the Clark County chapter of NFF announced a new award in honor of Mark Rego, the offensive line coach for the Union Titans who died in October. He was a huge part of high school and youth football for decades in the region. Kimberlee Rego gave a passionate speech about her husband’s love for football players and the game. Beginning this year, the award for contributions to amateur football is now named for Rego. Rick Fields, former chapter president and longtime youth football volunteer along with his friend Rego, was named this year’s recipient. Carl Click, a former television reporter in the Portland-Vancouver market as well as basketball and tennis coach in Clark County, was the master of ceremonies. The 2018 football season saw two state champions from Clark County, with Union taking the 4A trophy and Hockinson repeating as the 2A champion. Wednesday was another chance to celebrate so many accomplishments. Hoidal said he will always remember football as being a tool to help bring pride to Stevenson High School and the community. The Bulldogs won a league title in the fall. Harrison noted many things he learned from the game. “It taught me to be a leader,” he said. All nominees had to have at least a 3.0 grade-point average and volunteer in their communities.